A large Kenai River resident rainbow trout from the spring of 2017 season. The Rainbow trout (Oncorhynchus mykiss) population in the Kenai River of Southcentral Alaska is one of the state’s largest and is the driving force behind the most highly used trout fishery in the state in terms of angling effort. In this case, rainbow trout are caught by anglers throughout the drainage from tidally influenced waters up to Snow River, a glacially colored tributary that flows into Kenai Lake. Angling for trout in the Kenai River peaks in fall but occurs all year in some river stretches, with winter time low flows allowing better bank fishing access, but icy and cold conditions complicating the effort for winter anglers. Anglers catch trout in Kenai River drainage waters both as a desired target species as well as an incidental catch while fishing for salmon. Because of this non-target trout catch, the Kenai trout fishery is highly influenced by regulations and the effort of the Kenai River salmon fishery, which also happens to be the state’s largest sport fishery for sockeye and king salmon in fresh waters. The biology of Kenai River rainbow trout is primarily a freshwater resident life history, found throughout the watershed and is heavily influenced by the availability of other salmonids as a food source. The non-resident or anadromous form of rainbow trout know as steelhead, do exist in the Kenai River but are not very abundant. 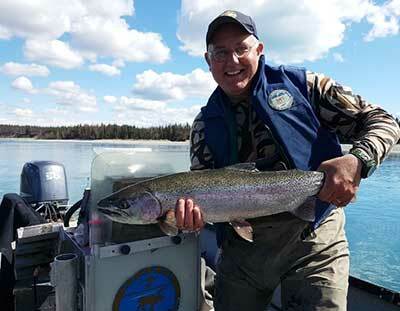 Rainbow trout in the Kenai River may be as old at 13 years with some reaching over 30 inches. The Alaska Department of Fish & Game (ADF&G) research program has shown that spawning areas around the middle river can have densities of 1,000 fish per mile. The highest known densities of fish are in the area below Skilak Lake, which is closed to all angling during spawning. Additionally, anglers report that high numbers of fish are in the lower river in summer/fall after salmon carcasses become available as a food source. ADF&G tagging studies have also shown that these fish are highly migratory and move about, from the lower river areas on up into areas in and between both Kenai and Skilak lakes. Trout are studied with tagging and size assessments roughly every ten years to determine if fishery regulations have been successful at maintaining stable trout populations. These assessments are measured against the corresponding regulations and catch statistics to determine the effectiveness of those angling rules. The riverine resident life history in the Kenai River rainbow trout population leads to seasonal movements within the drainage. Kenai River rainbow trout spawn in the spring. Spawning fish use certain areas of the tributaries and the middle and upper mainstem Kenai River to spawn. The Russian, Killey, and Funny rivers are a few of the tributaries that are used for spawning. Trout winter mainly in Kenai and Skilak lakes and begin to move into these spawning areas in early spring. Trout spawning is a fairy short event and is typically complete by mid-June. 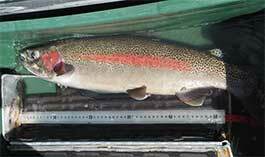 Typically, rainbow trout are the first to spawn in the river, followed by late spring arriving king salmon. As all species of spawning salmon move into the watershed in summer and fall, the trout utilize this food source wherever they are found. Fishing effort for Kenai River trout is both targeted, and dependent on other highly popular fisheries for other salmonids. All Kenai River fisheries are highly regulated and are high effort fisheries. Each year, as much as 25% of all Alaska angler hours can be attributed to Northern Kenai Peninsula Management Area waters, and of that, 78-82% is directed at Kenai River waters alone. Kenai River anglers are not all fishing directly for trout, but trout are often caught, especially during bait fisheries for coho and king salmon. The ADF&G statewide harvest survey shows that 313,000 angler days on average have occurred in Kenai River waters since 1977 when record keeping began. This same survey also showed that the most recent angler effort between 2012 – 2016 produced an annual average catch of 178,000 rainbow trout, and a harvest of 2,000. Notably, the harvest is quite small in comparison to catch. 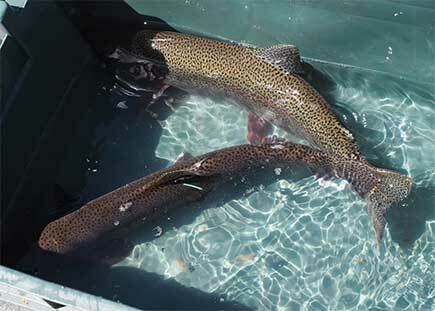 As noted earlier, some anglers may not be targeting rainbow trout, so these fish are released. But, for the most part, angling for trout in the Kenai River has become a large trout fishing experience focused on catch and release fishing by choice. Management of Kenai River trout is influenced by the anglers themselves within the complex regulatory environment found in the state’s largest and most intensively managed freshwater fishery. Anglers directly influence management rules on the Kenai River through the Alaska Board of Fisheries process. Currently, all angling regulations have been created with public input, resulting in a size limit allowing harvest of rainbow trout under 16 inches, several closed spawning areas, and bait limitations. Additionally, current regulations limit fishing during spawning times and many spawning areas are closed throughout the Kenai River drainage. These river and area specific regulations created through the board process, promote and help to sustain the survival of all sized fish for anglers to catch and release. Individual regulations like those found on the Kenai River are also augmented and guided by the State of Alaska’s wild trout management policy that describes general management targets like maintaining size at age characteristics in trout populations and maintaining habitat and food availability to foster long-term survival of both trout and popular trout fisheries. Of course, not all anglers have similar tastes. Some anglers would prefer to catch a lot of trout of a smaller size and take some home for dinner. Trophy fish angling is not for everybody. 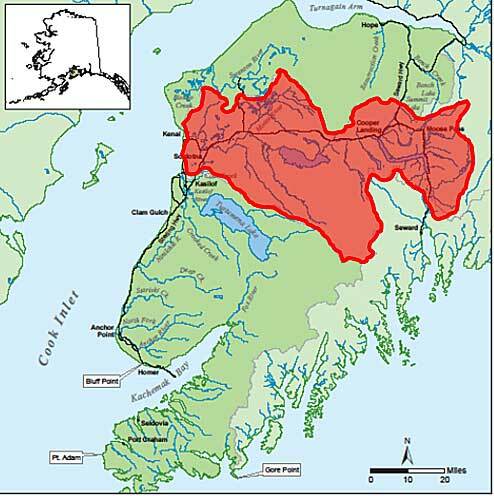 As such, since the Kenai River is part of a larger area, there are other areas in the Northern Kenai Peninsula Management Area that have regulations allowing more trout to be harvested. Areas like Swanson River and the many lakes on the Kenai Peninsula have more relaxed regulations that allow more fish to be harvested per day. Additionally, ADF&G has an extensive trout stocking program that augments local lakes where harvest is the main objective, and up to five fish per day can be harvested all year long. Likewise, a segment of the trout angling community also likes to ice fish, and stocked rainbow trout can be harvested all winter from several frozen-over lakes on the Peninsula. 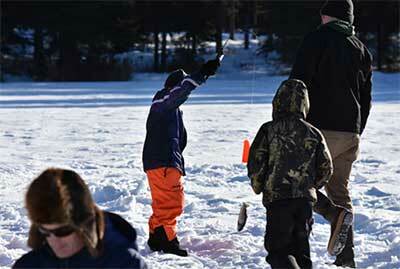 Ice fishing is often used as a community event, like family fishing day, where ADF&G and other government agencies and local non-profits collaborate to inform the public about fishing opportunities and biology. By providing many different types of fishing opportunities across the Kenai Peninsula all anglers can have a chance to harvest some fish while allowing the Kenai River trout fisheries to be maintained primarily as catch and release fisheries. For the foreseeable future management of Kenai River rainbow trout fisheries and those throughout the Kenai Peninsula area in general will continue to use the most current scientific research results, and the public process of involvement, while promoting sustainable fisheries for all types of anglers to enjoy in future generations. Brian Marston is the commercial fisheries management biologist for Upper Cook inlet based in Soldotna.